What is meant by Blood Clots ? What does a blood clot look like ? What causes blood clots ? Blood clots form when there is damage to the lining of a blood vessel, either an artery or a vein. The damage may be obvious, such as a laceration, or may occur on the microscopic level. As well, blood will begin to clot if it stops moving and becomes stagnant. Venous thrombosis or blood clots in a vein occur when a person becomes immobilized and muscles are not contracting to push blood back to the heart. This stagnant blood begins to form small clots along the walls of the vein. This initial clot can gradually grow to partially or completely occlude or block the vein and prevent blood from returning to the heart. An analogy to this process is a slow moving river. Over time, weeds and algae start to accumulate along the banks of the river where the water flows more slowly. Gradually, as the weeds start to grow, they begin to invade the center of the river because they can withstand the pressure of the oncoming water flow. Arterial thrombi (blood clots in an artery) occur by a different mechanism. For those with atherosclerotic disease, plaque deposits form along the lining of the artery and grow to cause narrowing of the vessel. This is the disease process that may cause heart attack, stroke, or peripheral artery disease. If a plaque ruptures, a blood clot can form at the site of that rupture and can completely or partially occlude the blood flow at that point. Blood clots in the heart. In atrial fibrillation, the atrium or upper chamber of the heart does not beat in an organized manner. Instead, it jiggles, and blood tends to become stagnant along the walls of the atrium. Over time, this may cause small blood clots to form. Clots can also form in the ventricle after a heart attack when part of the heart muscle is injured and unable to contract normally. Since the damaged area doesn't contract with the rest of the heart, blood can start to pool or stagnate, leading to clot formation. Blood leaking out of a blood vessel. Blood clots can form when blood leaks out of a blood vessel. This is very beneficial when a person gets a cut or scrape wound, because the clot helps stop further bleeding at the wound site. The clotting mechanism works well following trauma as well. Broken bones, sprains and strains, and nosebleeds all result in bleeding that is controlled by the body's clotting mechanism. Blood clots causing other medical problems. Sometimes, normal blood clotting can cause medical problems because of its location. For example, if bleeding occurs in the urine from any of a variety of reasons (such as infection, trauma, or tumor) clots may form and prevent the bladder from emptying, causing urinary retention. Clot formation in the uterus may cause pain when the clots are passed through the cervix and can lead to vaginal bleeding, either as part of menstruation or as abnormal vaginal bleeding (menorrhagia, dysmenorrhea). What are the risk factors for blood clots ? 2) genetic errors in the clotting mechanism. Immobility : Most commonly, when the body stops moving, the risk of blood clots increases, since muscle movement is required to pump blood towards the heart. Stagnant blood in a vein is prone to clot. What types of conditions are caused by blood clots ? Blood clots may cause life-threatening medical conditions, and are always considered in the differential diagnosis of any symptoms or signs. Differential diagnosis is the list of potential causes of a patient's condition, that is considered by the health care practitioner when caring for a patient. Deep venous thrombosis may lead to a pulmonary embolism. If there is a blood clot or thrombus in a deep vein, it has the potential to break off (embolize) and flow through the veins back through the heart, and into the lung where it can become lodged in a small blood vessel, which prevents the lung from functioning. Pulmonary embolism is a medical emergency and can cause serious illness or death. An embolus is the medical term for a blood clot that has moved with the bloodstream to a different location. With pulmonary embolus (pulmonary embolism), two issues occur. 1. The lungs' blood supply is comprised and the affected area of lung tissue may infarct, or die. 2. Because of the blockage, the ability of the lung to provide oxygen to the body is decreased and hypoxia (decreased levels of oxygen in the blood and throughout the body) may occur. Even if venous blood clots do not embolize, they may cause significant local problems with swelling and pain. Since blood cannot return to the heart if a vein is blocked by a clot, the limbs may chronically swell and have decreased function in a condition called chronic thrombophlebitis. peripheral vascular disease (occurring in the arteries of the legs). In atrial fibrillation, small clots may form along the walls of the atrium or the upper chambers of the heart. Should one of these clots break off, it may embolize, or travel in the bloodstream to the brain, blocking an artery and causing a stroke. Other arteries may also be involved by this process, including those that supply the bowel. This can cause mesenteric ischemia (mesentery=lining of the bowel + ischemia=loss of blood supply) and potential necrosis (tissue death) of the intestine. Clots can also affect blood supply to fingers and toes. Blood should clot anytime it becomes stagnant. This also means that clots will form when blood leaks out of blood vessels. Patients with rectal bleeding may also have clot mixed with the bloody stool if there has been time for the clot to form. Sometimes patients with urinary tract or bladder infections develop associated bleeding in their urine, and small clots can form. On occasion these clots may be so big that they cannot be passed and block the urethra, preventing urination and causing urinary retention. What are the symptoms of blood clots ? Pain is the initial symptom of the ischemia, or oxygen deprivation due to loss of blood supply. Other symptoms depend upon the location of the clot, and often the effect will be a loss of function. Heart attack and stroke are self-explanatory. In an arm or leg, in addition to pain, the limb may appear white, and weakness, loss of sensation, or paralysis may occur. If the blood supply is lost to an area of the bowel, in addition to intense pain, there may be bloody diarrhea. How are blood clots diagnosed ? The initial step in making the diagnosis of a blood clot is obtaining a patient history. The blood clot itself does not cause a problem. It's the location of the blood clot and its effect on blood flow that causes symptoms and signs. If a blood clot or thrombus is a consideration, the history may expand to explore risk factors or situations that might put the patient at risk for forming a clot. There may be symptoms that precede the acute artery blockage, that may be warning signs of the potential future complete occlusion of the blood vessel. Patients with an acute heart attack (myocardial infarction) may experience angina in the days and weeks prior to the heart attack. Patients with peripheral artery disease may have pain with walking (claudication), and a TIA (transient ischemia attack, mini-stroke) may precede a stroke. Venous thrombi may cause swelling of an extremity. It may be red, warm, and tender; sometimes the appearance is difficult to distinguish from cellulitis or an infection of the extremity. If there is concern about a pulmonary embolus, the clinician may examine the lungs, listening for abnormal sounds caused by an area of inflamed lung tissue. Arterial thrombus symptoms are much more dramatic. If a leg or arm is involved, the tissue may be white because of the lack of blood supply. As well, it may be cool to touch and there may be loss of sensation and movement. The patient may be writhing in pain. Arterial thrombus is also the cause of heart attack (myocardial infarction) and stroke (cerebrovascular accident) and their associated symptoms. 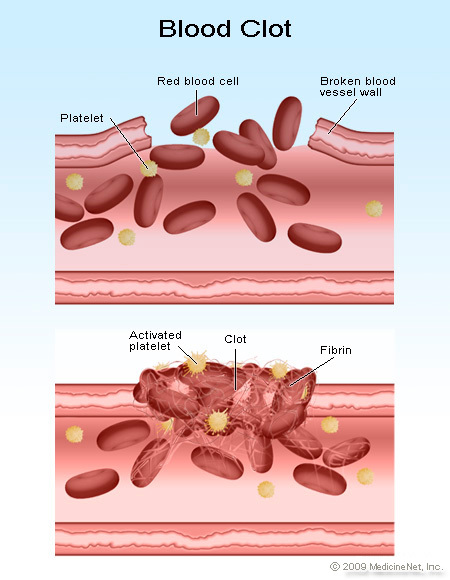 How are blood clots treated ? Clots in the superficial system are often treated symptomatically with warm compresses and acetaminophen or ibuprofen since there is no risk for clots in the superficial veins to embolize to the lung. They are connected to the deep system by perforator veins that have valves that act like a sieve to strain and prevent any clots form getting to the lung. Deep venous thrombosis usually requires anticoagulation to prevent the clot from growing and causing a pulmonary embolus. Initial therapy with injectable enoxaparin (Lovenox) is used to immediately "thin" the blood. Meanwhile, warfarin (Coumadin) is prescribed as an anti-coagulation pill. It takes a few days for warfarin to reach therapeutic levels and in this time frame, both the injectable and oral medications are used. Most often, patients with DVTs are treated as an outpatient and taught how to give themselves enoxaparin (Lovenox) injections. Occasionally, depending upon circumstances, patients may be admitted to the hospital for an unfractionated heparin intravenous (IV) injection. Blood clots below the knee are at lower risk for embolization to the lung, and an alternative to anti-coagulation treatment is serial ultrasound examinations to monitor the clot to see if it is growing or being resorbed by the body. Pulmonary emboli are treated similarly to deep venous thrombosis, but depending on the severity of the symptoms, amount of clot formation, and the underlying health of the patient, admission to the hospital for treatment and observation may be needed. This is especially the case if lung function is compromised and the patient is short of breath or is experiencing hypoxia, or low oxygen levels in the blood. Arterial blood clots are often managed more aggressively. Surgery may be attempted to remove the clot, or medication may be administered directly into the clot to try to dissolve it. Alteplase (Activase, TPA) or tenecteplase (TNKase) are examples of medications that may be used in peripheral arteries to try to restore blood supply. This is the same approach that is used for heart attack. If possible, cardiac catheterization is performed to locate the blocked blood vessel and a balloon is used to open the occluded area, restore blood flow, and place a stent to keep it open. This is a time-sensitive procedure and if a hospital is not available to do the procedure emergently, TPA or TNK is used intravenously to try to dissolve the thrombus and minimize heart damage. Stroke is also treated with TPA if the patient is an appropriate candidate for this therapy. What are the complications of blood clots ? Deep vein thrombosis of the leg or arm may cause permanent damage to the veins themselves and cause persistent swelling of the extremity. The life-threatening issue that may arise from deep venous clots is a clot that breaks off and embolizes to the lungs (pulmonary embolus), causing problems with lung function and oxygenation of the blood. Arterial thrombus often is a life- or limb threatening event, since organs and cells do not get enough oxygen. How can blood clots be prevented ? The main risk factor for deep vein thrombosis risks is immobilization. It is important to move around routinely so that blood can circulate in the venous system. On long trips, it is recommended to get out of the car every couple of hours and in an airplane routinely get up and stretch. Physicians and nurses work hard at getting people moving after surgery or while in the hospital for medical conditions. Enoxaparin (Lovenox) can also be used in low doses to prevent clot formation. Patients are often given tight stockings to promote blood return from the legs and prevent pooling of blood. In patients with atrial fibrillation, warfarin (Coumadin) is used to prevent clot formation and minimize the risk of embolus and stroke.